Looking at my early writings from the early 1980’s when I was living at Rhiwlas near Bala in North Wales, it’s interesting to see how I saw the relationship between the Welsh and their bigger more powerful neighbours, the English. When I wrote the words below I had lived all my life in England and only ever visited Wales as a tourist. I’ve now lived in the principality for over half of my life time and I feel proud to belong to a nation that has had so much thrown at it over the years. ….Back in the nineteenth century England had many colonies all over the world and was exploiting them. These colonies all had their own language and culture which the English could not begin to understand. Yet England looked on itself as superior and believed it had the right to exploit these lands. In the twentieth century much of these wrongs were highlighted and many of these colonies have gained independence and hopefully just in time. Perhaps they may be able to save their culture. The Welsh have not been so fortunate! Despite a slightly over simplification of the situation I had quickly come to understand the out of kilter relationship between Wales and its bigger neighbour. To hear people deride the Welsh and their culture in supposed jest or otherwise and to criticise them for for speaking their own language in their own country seemed then, and still does now, grossly unfair and founded on nothing more than a deep seated belief by the English that they are a more cultured and superior race and have a god given right to impose their own values on the Welsh culture and to see Wales as somewhere to be exploited in their own colonial expansion. I would class my own upbringing as being liberal socialist and could see the injustice of the relationship then as a young Englishman. I was about to spend a year living within a strong Welsh community and see at first hand the warmth of character and openness of a people who would have had every right to have treated me with at the very least caution and perhaps even hostility. I was also coming into their community to photograph them, perhaps even more reason to be a little suspicious and wary. Was I just another Englishmen come to exploit and allow a world beyond theirs to gawp at them as if some ancient tribe in a far off land? Or would I romanticise their existence and perpetuate the myth of an idyllic country existence? I knew how I wanted to document them, as honestly as possible with the simple eye of the observer, with no agenda and no edge, and they trusted me from the start. Since living in Wales for nearly thirty years now I’ve read a great deal of its history and my sympathies of how they have been treated by the English have grown stronger. I’m proud to live here and call myself a naturalised Welshman and enjoy living in a country that finally has its own Sennedd and is beginning to find a level of meaningful independence. To slowly reverse the tilt of the British Isles that leans heavily towards the south east must be the aim of any devolved government and that should include regions within England as well, like the north east and the north west who feel similarly exploited by the pull and power of London. I would strongly recommend any English person who has a condescending attitude to the Welsh and is not quite sure where its come from, to read Mike Parker’s Neighbours from Hell? English attitudes to the Welsh. Like myself he’s an Englishman who now lives in Wales, unlike me he’s mastered the Welsh language, I’ve a good grasp but never made that final push – maybe one day. My fathers used a stranger at my lips. We took the decision to have our children educated through the medium of Welsh and have never regretted it, as I’m sure they’ve not. All of them continue to use the language in some way. One teaches in Welsh medium education and also teaches Welsh to adults, another uses it in his work place and designs in both languages, and the third, has used it to spark projects in Cornwall (where she is currently studying Press and Editorial Photography at Falmouth) that have looked at the precarious but growing Cornish language that has many similar roots to Welsh. She is also photographing a Cornish village in some depth and is exploring a deep seated sense of community that exhibits itself there. This sense of community and belonging is something they have all felt growing up in Wales and being Welsh, and something I have come to cherish more and more. And what about the land itself? There’s a passage in Mike Parker’s book in a chapter entitled ‘The Celtic Fringe’, that serves to illustrate how the landscape in Wales has been used and abused and seen as fair game to exploit and then abandon. Once a place has been so throughly and so effectively marginalised, it makes it very easy to do absolutely anything unpleasant to it. 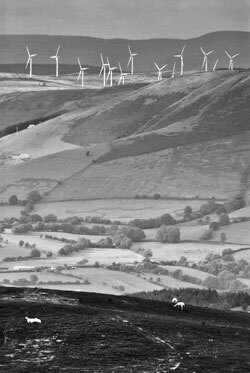 Almost every corner of wales is laden with features that shout and scream for it to be a landscape that has been left – indeed, perhaps, encouraged – to rot as a distant, marginal concern, scarcely to be bothered with. There are many examples of this, from fighter jets screaming over villages and valleys, to the abandoned quarries and mines that pock the landscape like festering sores. Coming down off the highest peak, Tarren-y-Gesail, gave me a view that perfectly symbolised the progressive exploitation of the landscape. In the immediate foreground was an abandoned slate quarry, great shards of sharp spoil pointing in all directions amongst roofless huts and winding gear. Behind that was a beautifully-shaped hill, cloaked by a tight cap of a fast growing conifers, leaving not one inch of space, sunlight or real nature between them. Behind that were hills dotted with whirring wind turbines, the latest incarnation of the long-standing belief that this wild, wonderful landscape is merely something to be ruthlessly exploited, that it has no inherent value of its own for anything other than what can be ripped from it, or imposed upon it. During the year I spent in Bala with the Edwards family they would often take an afternoon drive after sunday dinner. 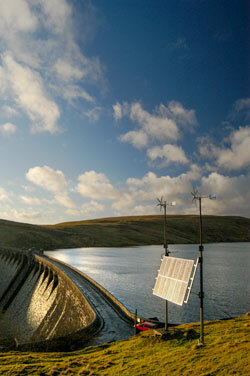 One of the spots they would go and took me to as well was Llyn Celyn on the road from Bala to Trawsfyndd. The lake is on the edge of the summer grazing grounds, Ty-Isa, which were used by tenant farmers to the Rhiwlas estate. I photographed both the summer and October gathers, both communal events with farmers from all over the area coming together to sort the sheep after bringing them off the mountain. I always felt a little uncomfortable taking a trip up to the lake as I was aware of the history behind it and coming from Liverpool didn’t help. The lake was constructed and created by flooding the village of Capel Celyn. Forty eight people lost their homes, twelve farms a post office a school and a cemetery were flooded along with 800 acres of land. The water held would supply Liverpool and parts of Wirral and involved drowning the village and the community that sustained it. Capel Celyn was a stronghold of Welsh language and culture and became a symbol for how, once again, Wales was to be seen as expendable in the eyes of its larger neighbour. Thirty five of the 36 sitting Welsh MP’s voted against it in parliament, the other one abstaining, but still it went ahead and was flooded in 1965, eight years after the bill had been passed that sanctioned the construction of the dam and the flooding of the valley. The local community and the wider Welsh Nationalist community fought an ultimately unsuccessful campaign to have the bill overturned. A list of the properties that were drowned gives a more poignant expression to the event and when I took the sunday trips to Celyn with the Edwards’ family it was with a degree of shame that I stood with them at the site of the memorial chapel that was built with the stones from the original. I have a photograph taken on one of these sunday excursions and I can remember this image haunting me at the time. Re-visiting it now I have the same sense of discomfort that I had then. 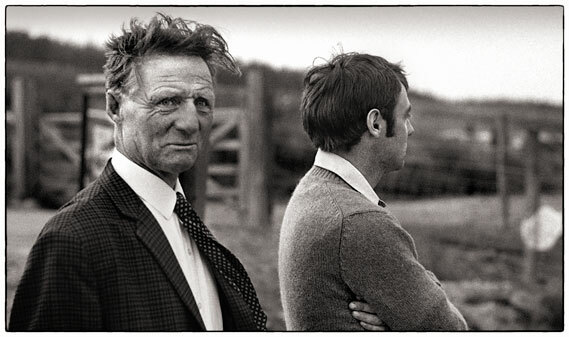 Emrys Edwards looks past me with a deep seated expression suggesting resigned anger, while his son, Tegwyn, looks wistfully out over the drowned community. What does that look of Emrys say? I was English Liverpudlian, perhaps just at that very moment a symbol of all that the community had fought against for so many years. He would have been around 50 at the time of the drowning and Tegwyn 16. They lived close enough to feel the impact personally and when I was starting my year photographing the community it was still in very recent memory, only fifteen years before. The family treated me like a son during my time with them and for all I may have stood for at that one moment they never mentioned it and never alluded to my English heritage. I embraced the culture and the language and was always treated as an individual and not as a representative of the bigger aggressive neighbour. My father in law relates a telling story of a passing visit to Capel Celyn before the drowning. Around 1954 he was traveling from Bala to Pwllheli through the old valley when his wife, Kitty, remembered that a friend of hers was getting married in Liverpool on that very day. They were passing Capel Celyn and decided to call into the post office to send a telegram. The telegram was to be cabled to Liverpool and although the request was placed in Welsh, both speaking the language, the telegram never arrived! Workers with theodolites were to be seen around the area and it was apparent that something was a foot. This would have been two or three years before the bill allowing for the impounding of the waters was passed and no doubt much surveying was already taking place with a predictable undercurrent of hostility towards the English and particularly Liverpudlians. Celyn was not the only valley to be flooded for the purpose of supplying water to England; Vernwy, again for Liverpool back in the 1880’s; Llyn Clywedog near Llanidloes flooded in 1967 to supply Birmingham and the West Midlands; Elan Valley opened in 1906 for the convenience of again, Birmingham; Llyn Brenig, 1976 for the North west of England. Returning again to R. S. Thomas, his powerful and heart felt poem Reservoirs speaks volumes, it appeared in ‘Not That He Brought Flowers’ in 1968 in probable response to both the Celyn and Clywedog schemes. I’d like to think that the images I went on to make during the year were faithful to a country I have come to adopt and that those who appear in them feel comfortable when viewing them. From sentiments written in the comments book that accompanied the major exhibition in Bala at the end of the year I believe the images were received well and that the community would welcome an opportunity to view them again in the near future. This essay was posted on January 5th, 2013.